Failure Analysis refers to the analyzing the root cause for the failure in a material and correcting the root cause of the failure which can be done by using various analytical techniques, expert science interpretations. The failure analysis market is valued at $5.4 billion in 2017 growing at a CAGR of 7.7% during 2018-2023. The Industrial sector generated over $700 million in the year 2017. As the technology is evolving the tools for identifying and correction of failure has becoming easy and increase in usage of technology is driving the failure testing market. What is Failure Analysis Market? Failure analysis is a process in which the root cause for the failure is identified and the correction in the product is done. This process primarily address the failures in components, structures and assemblies. This process is done by the experts in that fields who can identify the problem and who can make necessary changes in the products. This identification of failure is a multilevel process which includes the physical investigation of the product. Failure analysis of a physical object is often defined as a part of larger investigation whose intent is to prevent the failure. If the person has the board view of how to mitigate or prevent the failure there are less chances of failure of physical object. The failure analyst needs to understand how the product was used and the culture it was used. 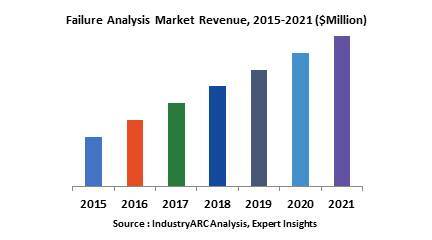 What are the major applications for Failure Analysis Market? The various end users accessed include Bio science, electronics, industrial science, material science. In material science the failure depends on the size, shape or material properties of structure. In the material related problems that may led to failure may include poor microstructure and contamination from foreign particles. The other new innovation particularly designed in detecting the sub surface cracks, is pulsed excitation of eddy currents. The penetration depth of eddy currents depends on excitation frequency this Pulsed Eddy Current (PEC) testing allows more volumetric inspection and fetches more information. Magnetic resonance imaging is another nondestructive examination method used in failure analysis focus on development of PET/MRI hybrid imaging system which combine the anatomical imaging and functional imaging data bringing the soft tissue characterization and imaging provided by MRI scans without ionizing radiations. The latest advancements in automotive failure analysis industry can be witnessed in vision based sensors and processors in-addition to artificial intelligence and high performance vehicles positioning and cloud connectivity. Manufacturers are developing performance analysis, vehicle dynamics studies, failure analysis, accident reconstruction, etc. Fourier transform infrared(FTIR) spectroscopy is one of the most widely applied techniques in failure detection which is well established in micro destructive analysis of small samples, the recent introduction of mapping and imaging equipment allow the collection of a large number if FTIR providing a distribution map of identified components. Who are the Major Players in Failure Analysis? The companies referred in the market research report includes Motion X corporation, EAG, SMT GmbH, A&D company, FEI company, IMR test labs, G2mt laboratories, Teseda corporation, RJ lee group and more than 10 other companies. The report incorporates in-depth assessment of the competitive landscape, product market sizing, product benchmarking, market trends, product developments, financial analysis, strategic analysis and so on to gauge the impact forces and potential opportunities of the market. Apart from this the report also includes a study of major developments in the market such as product launches, agreements, acquisitions, collaborations, mergers and so on to comprehend the prevailing market dynamics at present and its impact during the forecast period 2018-2024. 11.5. Energy dispersive X-Ray Spectroscopy. 12.15. Paper & Fiber material.